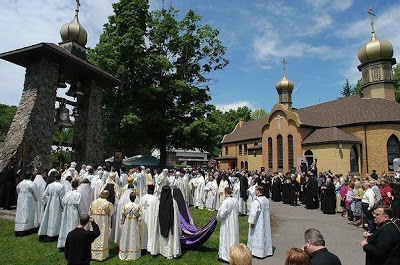 The community of Saint Tikhon’s Monastery and Seminary extends a most cordial invitation to all to attend the 109th Annual Pilgrimage over Memorial Day weekend, May 24-27, 2013. “It is always a joy to welcome hierarchs, clergy and faithful from the Orthodox Church in America, other Orthodox jurisdictions and guests from near and far,” said Igumen Sergius, the Monastery’s abbot. A detailed schedule of divine services for the weekend is available. Updates will appear as they become available on the Monastery’s web site. Saint Tikhon’s Monastery is the oldest Orthodox Christian monastic community in North America. In related news, Saint Tikhon’s Seminary will hold its 71st annual Commencement on Saturday, May 25. The day will open with the celebration of the Hierarchical Divine Liturgy at 9:00 a.m. and continue with graduation ceremonies at the Bell Tower at 1:00 p.m.